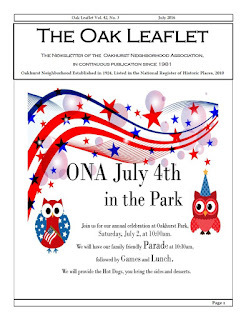 Oakhurst Neighborhood Association, Fort Worth, Texas: July Oak Leaflet Now Online! July Oak Leaflet Now Online! Check out this month's issue of The Oak Leaflet online! This month's newsletter covers ONA's latest award from Neighborhoods USA, our neighborhood's Little Free Library, July's Yard of the Month, Fred's Oakhurst Patrol Report (guest-authored by Phyllis), and more!